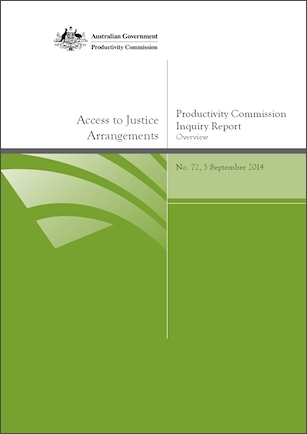 On 29 April 2016, the Attorney-General, Senator the Hon George Brandis QC released the Australian government’s response to the Productivity Commission’s 2014 Inquiry Report on Access to Justice Arrangements. The government response addresses 16 of the 83 recommendations made by the Productivity Commission in its report. Two of these concern pro bono services based on recommendations found in Chapter 23 of the Inquiry Report. The Commonwealth collects data on the number of pro bono hours legal practitioners on the Legal Services Multi-use List provide. The data indicates that the requirement to report pro-bono under the Legal Services Multi-use List is contributing to increasing pro bono services offered by law firms on the Legal Services Multi-use list. The Commonwealth may consider further strengthening the evaluation of pro bono services in the context of the outcomes of the Secretary’s Review of Commonwealth Legal Services to be completed by June 2016 (emphasis added). The Centre takes this to mean a consideration of strengthening evaluation mechanisms for pro bono work reported under the Legal Services Multi User List (LSMUL) arrangements. The Legal Services Directions 2005 require agency heads to coordinate the procurement of legal services to ensure that pro bono providers are not discriminated against because they have acted or may act in proceedings against the Commonwealth. The exception to this requirement is if an actual conflict of interest would arise. The Australian Government has not to date adopted the Victorian Government’s ‘coordinator role.’ The Australian Government is monitoring the effectiveness and outcomes of this proposal with interest and may consider the proposal in light of the outcomes of the Secretary’s Review of Commonwealth Legal Services to be completed by June 2016 (emphasis added). Firms should note that the provisions referred to that deal with possible conflicts against government by pro bono service providers are found in clauses 11.2-11.5 of the Legal Service Directions 2005. The Centre’s submission to the Secretary’s Review of Commonwealth Legal Services (December 2015) can be found here.